And so it was when I spotted this little gem on my thigh. I picked up a little heart-shaped souvenir during the Meteor MC Ride in the Pines dual sport ride over the weekend. Isn’t it cute?! Another great addition to my collection of heart and sole photos. 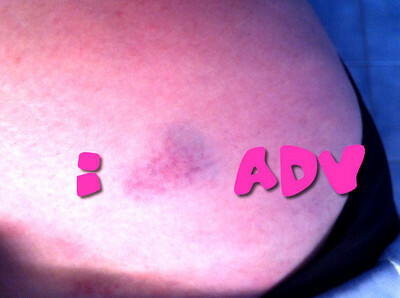 Bruises are often the price of adventure. At least you know where yours came from. A week ago, I felt and then saw a half-dollar shaped dark bruise on my hip and I have NO idea when that happened. A bump somewhere, sometime, that didn’t register as injury but will now stay with me for years. Oh, I hate mystery bruises! But the saving grace is they usually aren’t the result of something painful. Are you sure that’s not a hickey! LOL!